For the former and current Paramore member, see Josh Farro and Zac Farro. Farro is a food composed of the grains of certain wheat species, sold dried, and prepared by cooking in water until soft. People eat it plain, and often use it as an ingredient in salads, soups, and other dishes. Farro is an ethnobotanical term derived from Italian Latin for a group of three wheat species: spelt (Triticum spelta), emmer (Triticum dicoccum), and einkorn (Triticum monococcum), which are all types of hulled wheat (wheat that cannot be threshed). 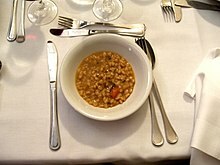 In Italian cuisine, the farro species are sometimes distinguished as farro grande, farro medio, and farro piccolo, respectively. Confusion is generated by the difficult history in the taxonomy of wheat and the colloquial, regional use of the term for specific wheat species; for example, emmer grown in the Garfagnana region of Tuscany is known as farro, and can receive an Indicazione Geografica Protetta (IGP) designation which, by law, guarantees its geographic origin. Emmer is by far the most common variety grown in Italy, in certain mountain regions of Tuscany and Abruzzo. It is also considered higher quality for cooking than the other two grains, and is sometimes called "true" farro. Farro is also sometimes referred to inaccurately as "spelt" in English (Dinkel in German), specifically distinguished from both emmer and einkorn. Regional differences in what is grown locally and eaten as farro, as well as similarities between the three grains, may explain the confusion. Some English-speakers now assume "farro" refers to steamed or boiled grain presented as salad and similar dishes, rather than to the grain itself (which can also be milled and made into bread or pasta). Spelt is much more commonly grown in Germany and Switzerland, where people use it in much the same way, and might therefore be called farro, as is épeautre (French for spelt) in France (where, like for farro in Italy, petit, moyen, and grand épeautre is grown). The Italian word farro derives from the presumed Latin word farrum, from Standard Latin far, farris n. : a kind of wheat (as in farina (food)). Far, in turn, derives from the Indo-European root *bʰar-es- : (spelt),	which also gave rise to the English word barley, Albanian bar : grass, Old Church Slavonic брашьно (brašĭno) : flour, and Greek Φήρον (phḗron): plant deity. The three species are sometimes known as farro piccolo, farro medio, and farro grande, which are einkorn, emmer, and spelt, respectively. 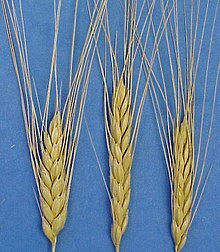 While these names reflect the general size difference between these three grains, some landraces of each overlap into the typical size range of the others. ^ Szabó, A. T., and K. Hammer. "Notes on the Taxonomy of Farro: Triticum monococcum, T. dicoccum, and T. spelta". Padulosi, S., K. Hammer and J. Heller, eds. 1996. Hulled Wheats. Promoting the conservation and use of underutilized and neglected crops. 4. Proceedings of the First International Workshop on Hulled Wheats, 21-22 July 1995, Castelvecchio Pascoli, Tuscany, Italy. International Plant Genetic Resources Institute, Rome. 2-3. Print. ^ a b c Markus Buerli (2006). "Farro in Italy" (PDF). The Global Facilitation Unit for Underutilized Species. Retrieved December 23, 2017 – via Bioversity International. ^ Hamlin, Suzanne (June 11, 1997). "Farro, Italy's Rustic Staple: The Little Grain That Could". New York Times. Retrieved November 22, 2012. ^ Schlegel, Rolf H. J. (2010). "Farro". Dictionary of Plant Breeding (2nd ed.). Boca Raton: CRC. p. 149. Print. ^ Julavits, Heidi (November 30, 2008). "Grain Exchange". The New York Times.